No one ever gets into a back game for choice. They require great skill, judgement and experience to master. 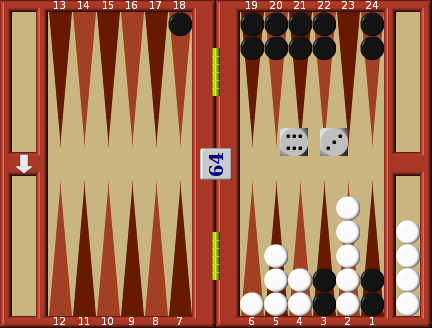 A back game almost always results in doubles and if they fail to save you, nearly always end up in a gammon or backgammon. 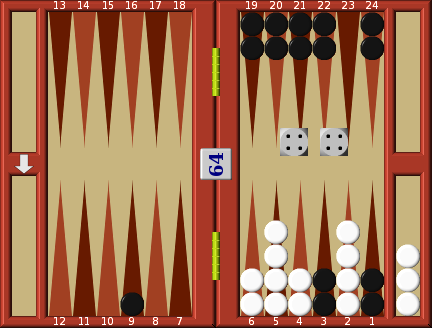 If you play backgammon regularly it is inevitable that you will from time to time find yourself either defending, or playing a back game, so that it is essential to master the technique thoroughly. The back game is often caused by a fight developing over a major point, such as the bar point, with repeated hits and counter-hits. When the battle is over, one player is left with several of his men driven into the opponent's home board, and in danger not only of being trapped, but also of being left far behind in a running race; it looks virtually certain that he is in the losing position. 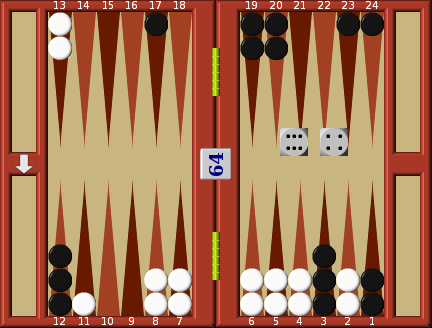 A back game can develop quite suddenly, as we shall see in this next game. Black wins the opening throw with 2:1 and plays 12-14, 17-20 in an attempt to gain control of his 5 point. White throws 6:4 and hits both blots, moving 24-14. Black throws 6:4 and enters one man on 4. White throws 4:2 and makes his 4 point putting Black back on the bar with 2 blots. Black throws 5:4 and re-enters one man on 5. White throw 1:1 and plays 6-5 with two men and 8-7 with two men to complete a 4 point blockade, and with both black men back on the bar. Black's position is looking very bad. Two men on the bar and no progress whatsoever. It looks as though White will either double him or play for a gammon. He throws 2:3 and re-enters both men on 2 and 3. White has no spare builders nearby so will probably not be able to close up his board any further and/or put Black's men on the bar. If he had still one or two men on the bar he would probably refuse the double, but now it should be possible to escape with two of his men, who with luck might well make a point the other side of the white blockade and be a constant thorn in his side when he brings his men home. If that fails it should be possible to turn his position into a back game situation. If he is forced into a back game, the advance of his own men into his home board is very delayed, so that again, with a bit of luck to help, by the time he hits a white blot his home board will be tightly closed up. He rates possession of the cube as a major advantage and judges that being able to pressurise White by re-doubling to 4 at the right moment is worth the risks involved. He therefore accepts the double. White throws his dice and gets 6:5, playing 14-8, 13-8 to construct a 5-point blockade. To hold two points in your opponent's home board. To have not less than five men on those two points. To have the development of your own home board very retarded. 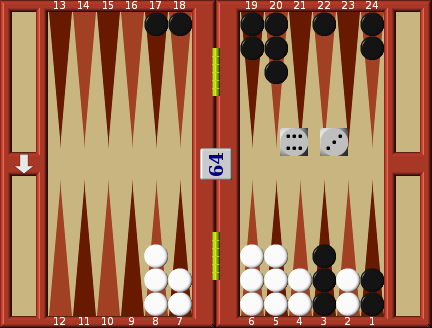 Black throws his dice and gets 6:1. No longer does he use this throw to make his own bar point, instead he first plays 2-3 to gain control of a second point in White's home board. This fulfils the first requirement of a back game. Now he must somehow get at least one more man back so that he has not less than five men on those two points. So he plays 12-19 in the hope that the blot will be hit by the white runner. 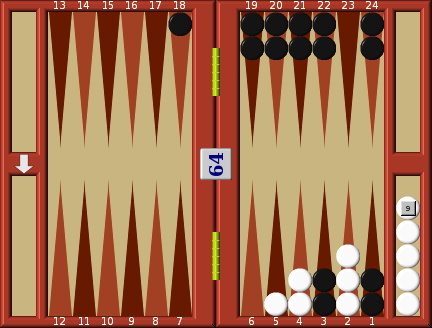 White, realising that Black is playing a back game, does not intend to do anything to help Black improve his position. 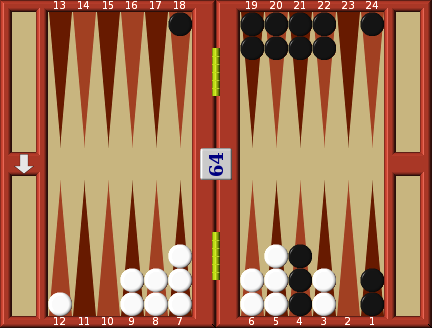 He will do his utmost not to hit another black blot, and will also try to tempt Black to destroy his back game position. He throws his dice and gets 6:1 and plays 13-6. Black throws 3:2 and immediately exposes 2 more blots in a determined attempt to make White hit him, by playing 17-20, 19-21. If he can tempt Black to hit him, it will break up his back game position, and there will be no difficulty about re­entry. 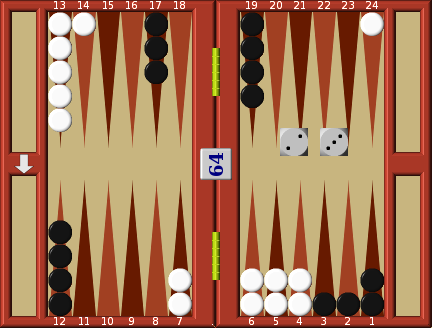 Black's home board is wide open. He then anticipates pointing Black rapidly on 3, and hitting a lot of black blots in Black's home board, so that he will have so many men off the board that it will be very difficult to re-enter them. If this comes off he is certain of a gammon, and a backgammon would be within reach. Black throws and gets 6:5. He refuses the temptation of hitting White on 9. There is no point in hitting the blot at this stage; it could not be trapped in his home board. The only throw that might have tempted him would be a 6:6. 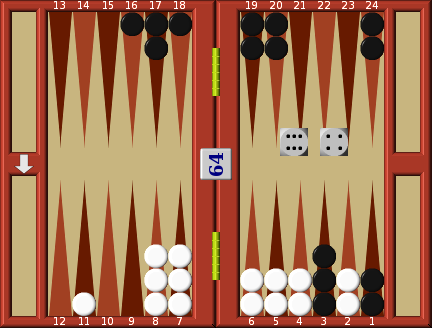 Therefore he continues with his aim of forcing White to hit another blot by playing 17-23 and 19-24, to place White on the bar. White throws 4:1 and has no option; he must hit a black blot. He re-enters on 21 and plays 9-8 with the 1. Black throws 6:4 and cannot re-enter. This does not worry him. He still has plenty of time on his side, and the loss of a throw ensures that he does not develop his home board too early in the game. White throws 6:4 and makes 2 by moving 8-2, 6-2. He will need control of this point as an extra landing point for his returning men. Black throws 3:2. He re-enters his man on 3 to complete a perfect back game position, and then starts on the final requirement, building up a closed home board by moving 18-20 to make his 5 point. White throws 6:4 and plays 21-11. Black throws 5:1 and plays 12-17, 23-24. White throws 6:5 and plays 13-7, 13-8. Black throws 6-4 and brings down 2 more builders playing 12-18, 12-16. White throws 6:1 and plays 11-5, 7-6. 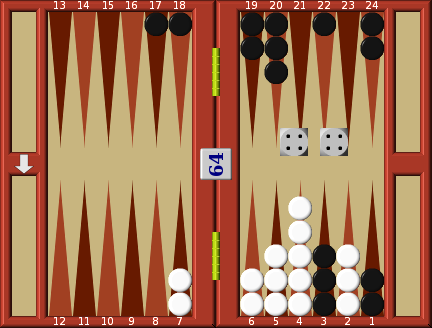 Black throws 6:3 and drops one blot into his home-board, 16-22 and brings in a builder by moving 17-20. White throws 4:4 and moves 3 men 8-4 and one man 6-2. Black throws 5:6. He covers his blot with the 5, 17-22, and now uses the spare man on 3 to absorb the 6, moving 3-9. White throws 2:1 and brings his last two men into his home board 7-5, 7-6. Black throws 3:1 and makes his 4 point, 18-21, 20-21. With his board almost closed up he is now ready to hit a white blot. White throws 4:4, moves one man 6-2 and removes three men from 4. 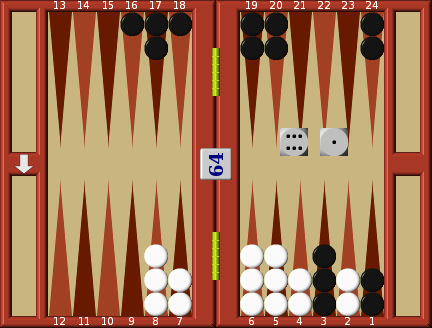 Black throws 5:4 and moves 9-18. White throws 6:3. 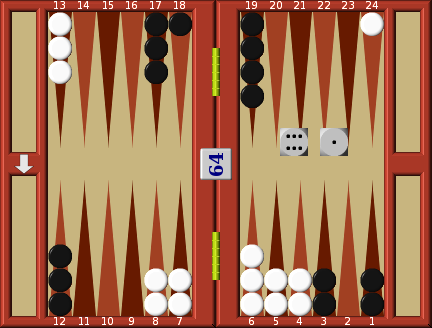 He is forced to remove one man from 6 and cannot move the 3 with the remaining man on 6 so is forced to leave a blot. He moves 5-2 with the 3. At last Black's opportunity has arrived: any dice combinations containing a 5 or a 3 must hit the blot. 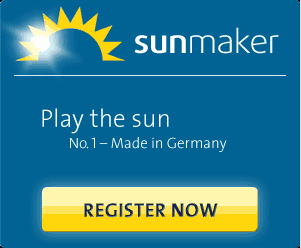 The odds are in his favour, but he does not make the mistake of re-doubling White. There are still 16 dice permutations that will miss the blot, so if he re-doubles at this stage White will accept, and failure to hit the blot will result in an instant re-double. Black throws and gets 5:5. He hits the blot and rushes the same man round the board to be ready to assist with closing up the last open point in his board. White throws and fails to re-enter his man. Black promptly re-doubles White to 4. White declines the re-double. 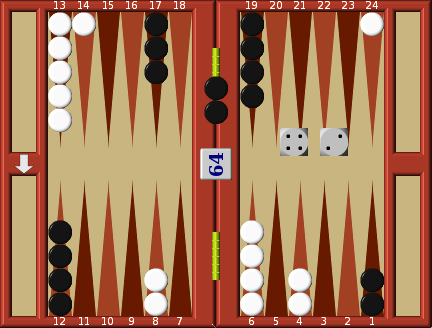 Firstly he has to re-enter his man, secondly he has to escape from Black's rapidly closing board, and even having done this Black has three further men that will be lying in wait to drive him back. This has been an example of a perfect back game, well-timed and with both sides playing with skill, refraining from hitting blots at the wrong time. Because back games invariably involve doubles and re-doubles it is necessary to examine some likely situations that have not come up in this sample game. Black will probably get one or two men off before he is forced to open a point. When he does open a point White's chances of re-entry are 11 in 36, so you must assume that White will not re-enter until his second attempt. By this time Black will have four or five men off. 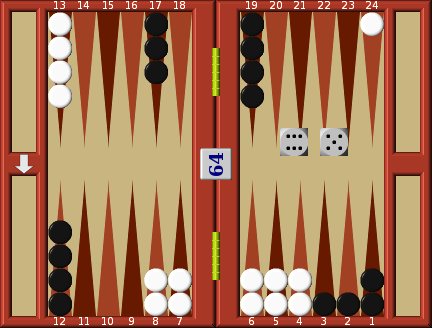 It is going to take White 1 1/2 to 2 turns to get his man back to his home board, by which time Black will have between seven and eight men off. Therefore your guideline in this situation is that you refuse the double unless you have more than half your men off the board. In this instance you would accept. If you have two men on the bar you always refuse. To re-enter and bring two men round the board makes your position hopeless even if you only have two men left in your home board. Equally with the situation in diagram White does not double if Black fails to hit. 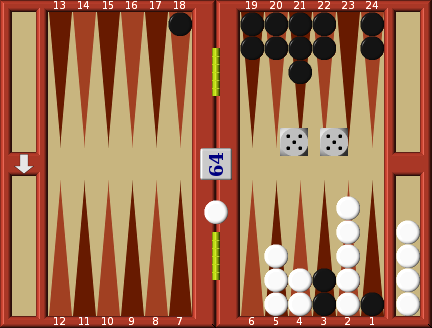 With luck White will win by at least a gammon, if not a backgammon. If Black hits one of the last white men, White can then promptly double Black and he will refuse. Once again Black has the first two requirements of a back game, having five men back and holding two points in White's home board. But in this case White should double him. Black's home board is far too advanced, and by the time he hits one of White's blots he is going to be forced to move down in his board, probably leaving the 6 and 5 points vacant. Re-entry will prove no problem when a blot is hit. In such a position Black should refuse the double. 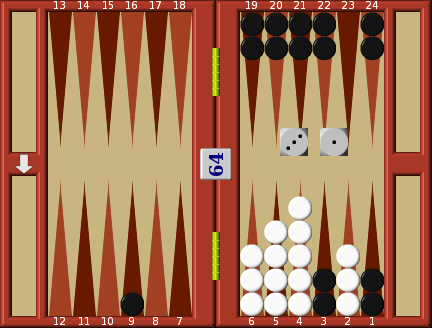 Back games are difficult to win, and no one goes into one if he has any alternative. Judgement of the position cannot be fully explained and to become expert at the back game requires a great deal of experience.